Rockabilly culture knows no age. Does your little one have the spirit of rock & roll? Show it off with our rockabilly baby clothes. Often times you can tell a lot about a person by the way they dress, and your little one is no different. Does your child light-up when an old Johnny Cash song pops on the radio? Does he dance the twist and show off a rock & roll spirit on a daily basis? If so, why deny them the opportunity to show off in our rockabilly baby clothes? The rocker inside will not be denied. At Punkabilly Clothing we believe that rockabilly knows no age. Morning, noon or night, we’ve got exactly what your little one needs to show off their love of rock and roll. We’re looking at 4 of our favorite rockabilly baby clothes picks for the year. This rockabilly baby onesie tells the tale of a baby in the womb, waiting to come out and grow some slicked back rockabilly hair and enter the world with a guitar in hand. This adorable and hip black and white striped onesie reveals your babies 9-month journey you’re your belly’s prisoner to worldly freedom! Have you ever seen something more amazing for your little one to rock? Too cool to be skipped – this simple, but awesome rockabilly baby jacket with a hood is a true punk rock symbol. It has skeleton bones printed on both sides and sleeves. 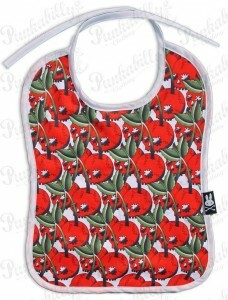 This unusual piece of clothing will be interesting to your child for sure. It’s never too early to be unique! It’s no secret that babies are… well, messy to say the least! Spice up your little one’s style with this cherry skulls baby bib. Satisfy the little rebel within your little one, even while they’re dripping applesauce all over themselves! You know it’s true, we know it’s true, and your little one definitely knows it’s true. Embrace the truth while you can with our rocktastic “my mom rocks” onesie. 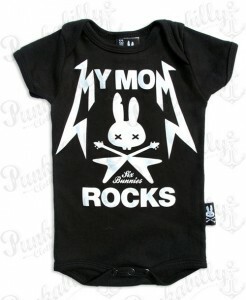 The message is very clear, white print on black cotton says: “My Mom Rocks”! This short sleeved piece of rockabilly baby clothes awesomeness is a onesie made just for the most rebellious babies who love punk rock… and mom, too. Don’t worry dad’s, we have one for you! Want to be the coolest parent on the block? We know you do. Show the other kids on the playground that your kid is the one to know with our rockabilly baby clothes and retro kid’s line from Punkabilly Clothing.